On the top floor of the Seven Hills Public school in Bhopal, is a balcony that has been enclosed with a grill. One can see 4-6 year olds playing with mud, clay, various toys and a teacher in the background observing the children, occasionally participating in the activity they are doing. This is the school’s “Learning Center”. This is their attempt to engage children in activities that would help them explore their kinetic and motor skills, spatial intelligence, simple arithmetic, social skills. The teacher observing them develops an understanding of what each child is learning and this informs her engagement with the same children in class. The mathematics classrooms in the Vidya Bhawan schools, Udaipur are remarkably different from most other mathematics classrooms. There is an active use of physical material – toys, boards, abacus and other educational tools to demonstrate not just basic arithmetic but also relatively complex mathematics. The attempt is to build a child’s understanding of mathematics stemming from the concrete to the abstract. 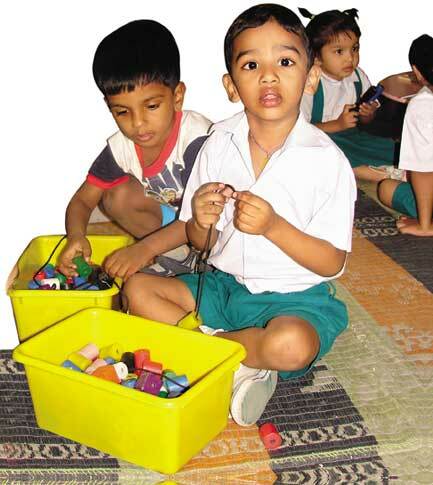 Little Angels is a similar school in the town of Pondicherry. Over the past 2 years they have been assessing the conceptual learning of their children and revisiting their teaching-learning and assessment methods. This year they have incorporated an assessment process that focuses on conceptual learning rather than memorisation. This assessment is done on a continuous basis so it informs teachers and helps them in the teaching-learning process. Obviously they had to engage in an intense dialogue with the parents to explain the changing nature of their tests. Over the past few months the parents’ response is changing from concern to interest; some of them are probably not entirely convinced yet. This is true, but what is notable about these three and many other examples of “mainstream” schools, is the self-initiated attempt to engage in a process of reflection and self-analysis. They have now embarked on a journey of change. A journey through which they desire to liberate themselves from the mainstream school culture and the popular notion of what a good school should be like. This is not an easy task! A school is a complex system with multiple stakeholders – children, teachers, management, parents, the community and other competing schools. The power of status quo is immense and any step towards breaking norm is not an easy one. The school needs to deal with internal pressures and resistance, the strong influence of a popular understanding of education, societal pressures and on top of all this, there is the need for a school to continue to exist and remain popular in the eyes of the parents. This causes immense emotional and intellectual churn and requires drive, confidence and an innate belief in what they are aspiring for. Most important in this process is the trigger. What initiates this need for change? It could be a person, an event or a challenging situation. Once this trigger creates a zone of discomfort and some things are taken up by one individual teacher, others join in the thought process and very soon there is a felt need to structure things and create a concerted intervention. An intervention whether from within or by an external agency, provides an outsider perspective, insight into other similar experiences, a source of knowledge, skills, techniques, research and literature that initiates and continues to catalyse the process of change. There are examples of schools like Vidya Bhawan where some teachers have got together to form a core group that plays the role of a catalyst and an intervener. In other situations it is an organisation like Eklavya or Educational Initiatives driven by a desire to reform the education system that plays the role of a mirror, an observer, a guide and initiates the process and helps the school create systems that will help them continue with this process of change. Wipro has been working with more than 20 organisations across the country in a similar way. Over the past few years we have learnt that the process of school reform is a gradual and intense process and proceeds in an organic manner. Each school depending on the context it resides in, its need, the community it caters to, takes up some aspects of their school and starts working on them. It could be a change in pedagogical methods, in classroom culture, in assessment, the introduction of a more engaging parent-teacher interaction…the possibilities are numerous. And naturally, teachers are the crux of any idea of school change. Slowly the success of each change influences, tempts, coaxes and cajoles everyone in the system to participate in this process. This process requires constant re-fuelling and re-charging, so the onus continues to lie with the school. The intervener has to play the role of a catalyst. The author is with Wipro Applying Thought in Schools. He can be reached at iyer.prakash@wipro.com.